Anyone here good with graphic design? I need this logo replicated as a vector, so I can scale it as required. Anyone who can do it, can you give me a price please. I should be able to find time today to get that sorted and email it over. Your continuing sense of humour is more than payment enough. I’ve been having a play with it in Illustrator, but I’ve only got cs5 and have never worked out how to do stuff in it anyway. I know this is terrible, but I still don’t understand all this SVG stuff. I opened that file, and it’s a load of code. I added that code to the BP SVG stack and in preview RW is now returning an error message. Al that now appears is that code! Oh bollox, loads of that code isn’t appearing. What? Hang on, 2005 is on the phone, it wants my skillz back. Oh, left the svg tags in place and it seems to have worked. Although I still need it as a vector, for print and stuff. but mucho gracias Paul. 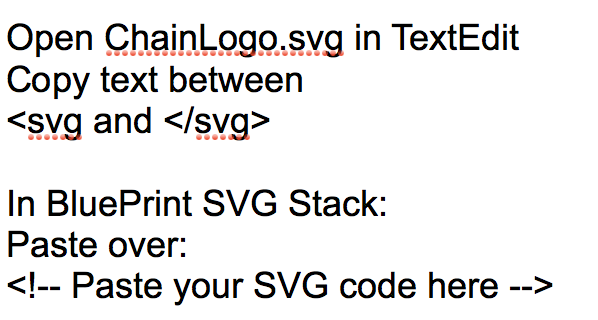 the svg file can be imported into any app … even MS Word! Forget Illustrator and Affinity Designer. Use Graphic App and it will take you a couple of minutes. I actually thought I’d bought AD, then dumped it as I didn’t like it. Can’t see it in my purchased list now though. I’m rubbish with everything bar Photoshop. I use it for everything when I know I shouldn’t, but after 20 years using it, it’s a hard habit to break. I’ve added that SVG to the project now, it’s not the one in the menu (don’t think MG can use SVG’s? ), it’s in use on the long down the page s bit though. I’m getting some cards and stickers made up, that’s what I need the vector for. I’ll throw out a few sizes of it as a png for ya in a bit and post them here. Oooh, I quite like the alt2 version. TVM. Gary, can you do the vector thing with that one? I would say that Paul has pretty comprehensively done the vector thing for you. Not bad value for a night out and foot rub with Paul. Hang on, who has to rub whose feet?